"This world is nothing but evil, and all of us are full of evil one way or another, in whatever we do. We have evil in us, all of us do." After making a series of films about the lives of infamous and/or notorious celebrities (Tupac Shakur, Kurt Cobain and Courtney Love, Heidi Fleiss), documentary director Nick Broomfield (along with co-director Joan Churchill) has come out with yet a second documentary about Aileen Wuornos, the Florida prostitute who murdered seven men over a 13 month period between 1989 and 1990, and who was eventually executed by lethal injection in Florida on October 9, 2002. Thanks to the press, Wuornos earned the moniker of "America's first female serial killer," a title which elevated her to the top of some morbid true crime fascination that we seem to have regarding ranking the status of murderers in this country. Broomfield's first film on the subject, Aileen Wuornos: The Selling of a Serial Killer (1992), concerned not just the crime and Wuornos' trial, but of exposing the greedy and self-centered agenda of law enforcement and assorted pivotal witnesses who allegedly had big money Hollywood deals in the works concerning the case. 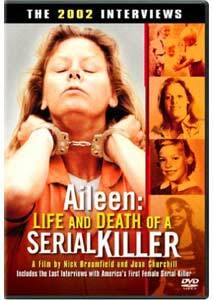 In Aileen: Life and Death of a Serial Killer, the filmmakers explore not only the events since Wuornos's death row sentence in 1992, leading up to her execution ten years later, but of the string of startling and horrific events that made up her seemingly miserable life. Broomfield and Churchill conducted a series of interviews with Wuornos in 2002, and that is the hook on this second go round, as it shows, in unflinching detail, the slow unraveling of a wild-eyed, dangerous, paranoid, delusional and explosive individual. This is not just a "true crime" doc, but is built around the disjointed and contradictory ramblings of Wuornos, as well as a peek under the slightly dented hood of the legal system. We see interviews with family friends (though if you have seen this, then "friends" may not be the best word), and there is an attempt here to fill in her backstory, something that comes close to painting an oddly sympathetic picture of Wuornos, and how the stacking of horrible situation on top of horrible situation over time can literally erupt into violence. Broomfield and Churchill may have a somewhat liberal bent to their narrative, but it is clear that Wuornos was a murderer; the underlying question here isn't whether she committed the crimes, it is something she readily admitted. During the course of Aileen: Life and Death of a Serial Killer, Wuornos herself discounts her own "self defense" testimony from her 1992 trial, and seems shocked when Broomfield tells her he thought it was rather convincing. We get to see the very same testimony, and her storytelling skills are certainly compelling. She did brutally murder seven men, so I don't think Broomfield and Churchill are trying to necessarily deify her in anyway, but by the time they close the film with their final interview with Wuornos, shot less than 24 hours before her execution, they have quietly raised the point of whether or not she was sane at the time her sentence was carried out. The final interview itself is a fascinating and spooky thing to watch, and the revelations along the way tell a story that is layered in compounding grief and tragedy. But try telling that to the families of the men she killed. Image Transfer Review: The back covers states this is presented in 1.85:1 full frame, when in reality it is simply good old 1.33:1. Image quality is certainly more than tolerable, looking as clean and presentable as a documentary shot largely on what appears to have been hand-held video will look. Broomfield and Churchill incorporate a number of different sources throughout their film, and quality varies depending on from where it came, with the jailhouse interview segments with Wuornos coming out as the best looking pieces overall. Audio Transfer Review: Audio is presented in 2.0 Dolby Digital Surround, and as with most documentaries, the soundfield avoids any broadly overdone aural theatrics in favor of a simple, clean narration-driven track. There is a minimal use of music, at least until the closing credits, and the whole film has a vaguely inherent flatness to the presentation, but Broomfield's detached narration and Wuornos' paranoid rants—which make up much of the film—sound clear. No hiss or distortion is evident. Extras Review: The packaging and sparse extras seem geared as a marketing ploy for the release of Charlize Theron's star-making turn as Wuornos in Monster, which is an indirect shame considering how riveting Broomfield's doc is. In addition to a forced trailer for Monster (as well as a prominent link on the menu), there is also an insert touting Theron's Oscar win and the corresponding DVD release of her film. Aside from that, all that's here are a couple of other trailers Trapped, In The Cut). The disc is cut into 24 chapters, and features optional French subtitles. Nick Broomfield and Joan Churchill's latest documentary on the life of serial killer Aileen Wuornos is unexpectedly thought-provoking and unsettling. Whatever your stance on capital punishment, watching this film will likely make you question your beliefs. Get this one before you pick up Monster. This is the real deal, and infinitely more chilling and disturbing than any fictional account could ever be.